Cornell College Mt. 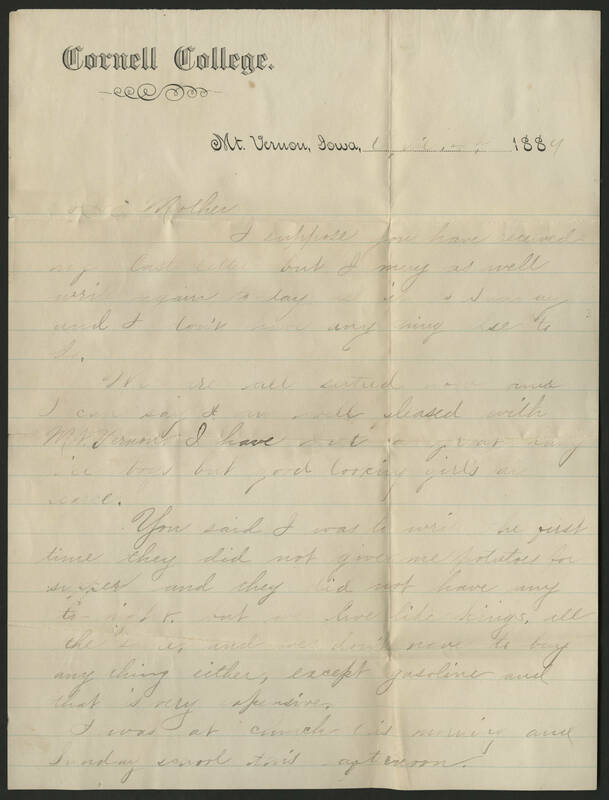 Vernon, Iowa April 14th, 1884 Dear Mother, I suppose you have received my last letter but I may as well write again today as it is Sunday and I don't have anything else to do. We are all entred now and I can say I am well pleased with Mt. Vernon. I have met a great many nice boys but good looking girls are scarce. You said I was to write the first time they did not give me potatoes for supper and they did not have any tonight, but we live like kings, all the same and we don't have to buy anything either, except gasoline and that is very expensive. I was at church this morning and Sunday school this afternoon.